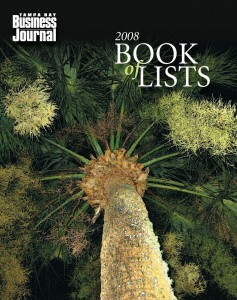 Madelyn McMillan Wise with her Book of Lists cover artwork. Photo by Kathleen Cabble. About 500 local businesspeople gathered at the Reo Center on the evening of Jan. 17 to celebrate the release of the Tampa Bay Business Journal’s 2008 Book of Lists. 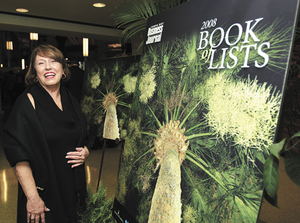 The event was sponsored by Bank of Florida, BlueCross BlueShield of Florida, Bright House Networks, Fowler White Boggs Banker, Modern Business Associates and Teasdale Worldwide.